In a sense, my work is haunted by space, actual and metaphorical, remembered and constructed. My photographs grew out of the need I felt to document actual spaces, especially the space of my childhood. At a certain point, I realized that in order to go forward as an artist, it was necessary to return physically to my childhood home in Morocco and to document this world which I had left in a physical sense, but of course, never fully in any deeper, more psychological sense. In order to understand the woman I had become, I needed to re-encounter the child I once was. I needed to return to the culture of my childhood if I wanted to understand my unfolding relation to the “converging territories” of my present life. This culture, and the space of my childhood within it, was defined for me by specific domestic spaces, ones that still exist, but are in the process of slowly deteriorating. So I embarked on a project to photograph these physical spaces before they were lost, and in doing so, to see the role they played in shaping the metaphorical space of my childhood. 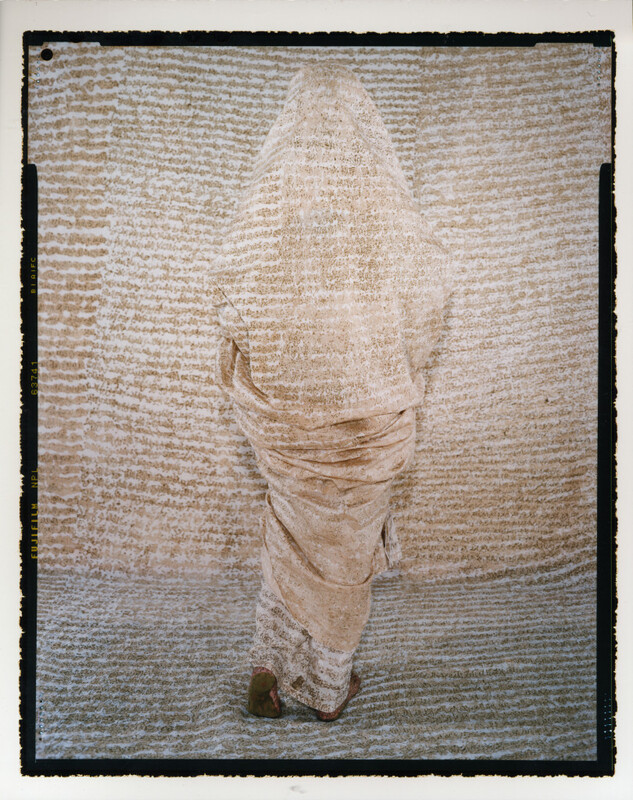 It is obvious that while my photographs are expressions of my own personal history, they can also be taken as reflections on the life of Arab women in general. There are continuities, of course, within Arab culture, but I am uncomfortable thinking of myself as a representative of all Arab women. Art can only come from the heart of an individual artist, and I am much too aware of the range of traditions and laws among the different Arab nations to presume to speak for everyone. My work documents my own experience growing up as an Arab woman within Islamic culture seen now from a very different perspective. It is the story of my quest to find my own voice, the unique voice of an artist, not an attempt to present myself as a victim, which would deprive me of the very complexity I wish to express. These photographs have led me to a greater understanding of the importance of architectural space in Islamic culture. Traditionally, the presence of men has defined public spaces: the streets, the meeting places, the places of work. Women, on the other hand, have been confined to private spaces, the architecture of the home. Physical thresholds define cultural ones, hidden hierarchies dictate patterns of habitation. Thus crossing a permissible, cultural threshold into prohibited “space” in the metaphorical sense, can result in literal confinement in an actual space. Many Arab women today may feel the space of confinement to be a more psychological one, but its origins are, I think, embedded in architecture itself. 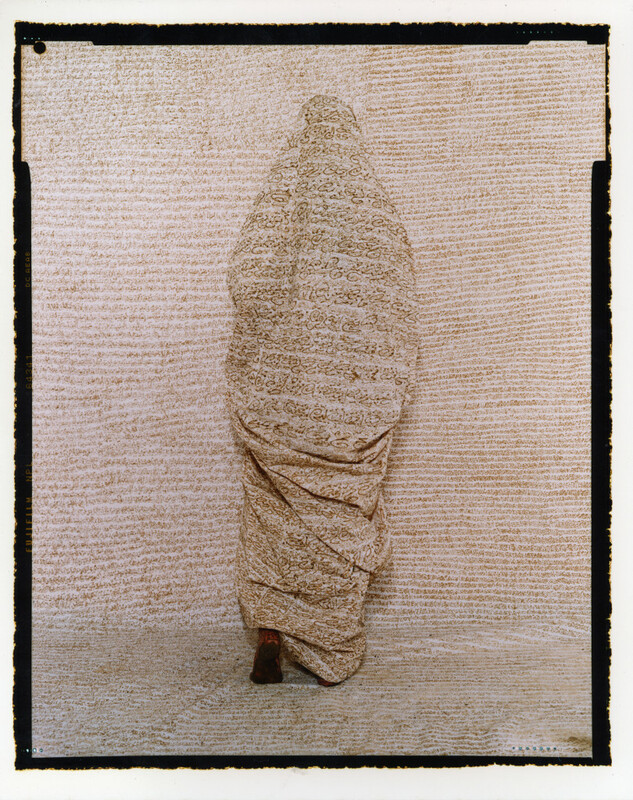 In my photographs, I am constraining the women within space and also confining them to their “proper” place, a place bounded by walls and controlled by men. 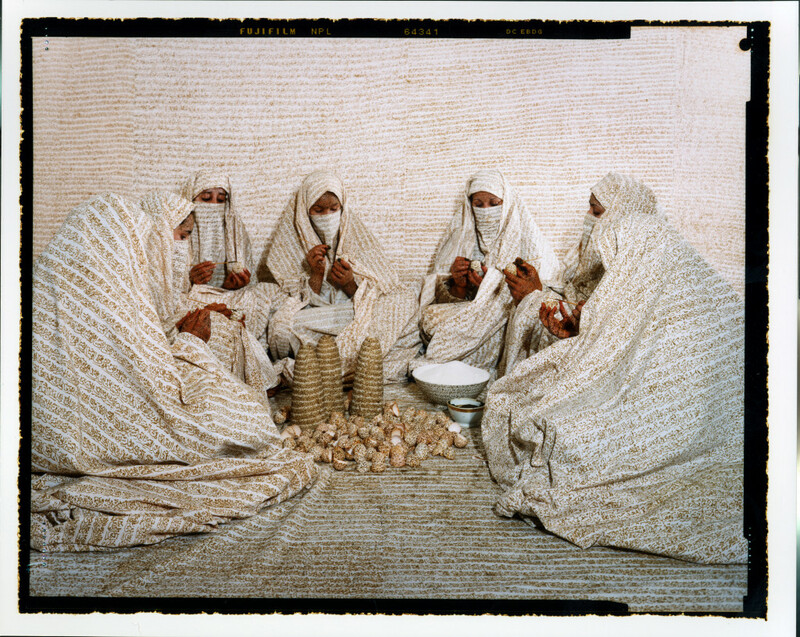 The henna painted on their bodies corresponds to the elaborate pattern of the tiles. The women then, become literal odalisques (odalisque, from the Turkish, means to belong to a place). But my work reaches beyond Islamic culture to invoke the Western fascination, as expressed in painting, with the odalisque, the veil, and, of course, the harem. Here is another way in which my work cannot be read simply as a critique of Arab culture. Images of the harem and the odalisque still penetrate the present and I use the Arab female body to disrupt that tradition. I want the viewer to become aware of Orientalism as a projection of the sexual fantasies of Western male artists––in other words as a voyeuristic tradition. It is not only the West that has been prevented from seeing Arab culture accurately. How people in the Arab world see themselves has also been affected by the distorted lens of Orientalism. There is some evidence that the Orientalist perspective has had an impact on the actual lives of Arab men and women, and especially that the rules for Arab women became much stricter as a result of Western influence. When the West portrays Eastern women as sexual victims and Eastern men as depraved, the effect is to emasculate Eastern men, and to challenge the traditional values of honor and family. So Arab men feel the need to be even more protective of Arab women, preventing them from being targets of fantasy by veiling them. 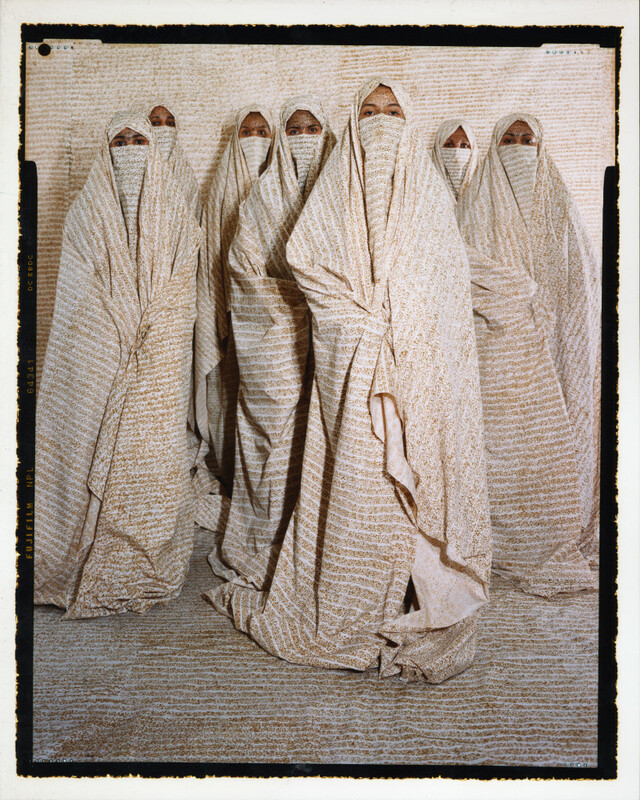 The veil protects them from the gaze of Orientalism. While we’ll probably never know whether the return to the veil and the rules that accompany it is a response to Western influence or merely coincidental, it is hard to believe there is no relationship. In a sense what the West did was to erase the boundaries of public and private; in part the Arab world responded by re-instating those boundaries in a way that would be clear and visible. 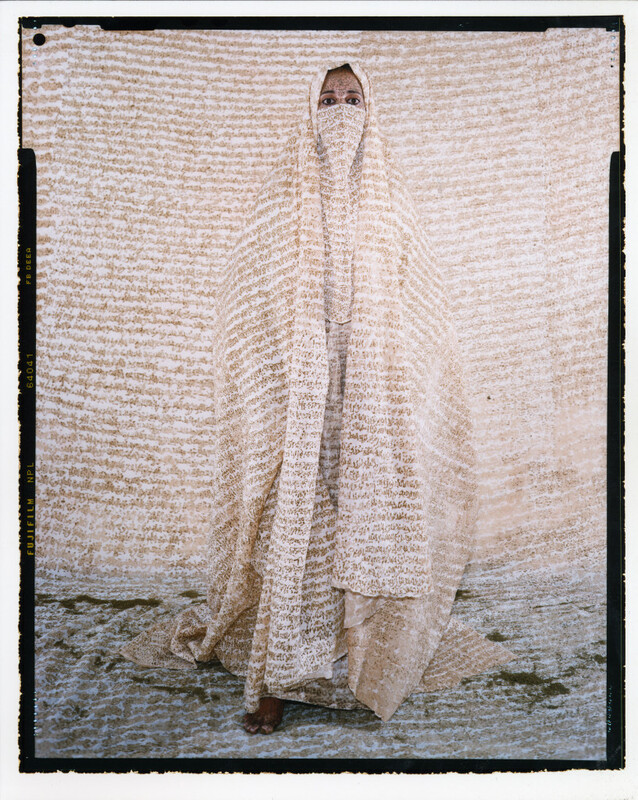 Within the veil, an Arab woman has a private space. 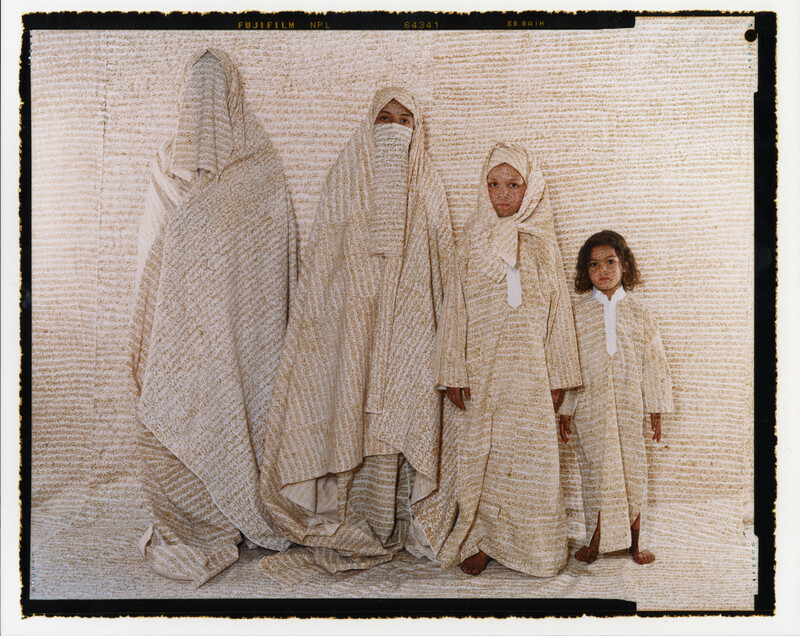 I want to stress that I do not intend my work simply as a critique of either culture, Arab or Western. I am going further than mere critique to a more active, even subversive, engagement with cultural patterns, in order to get beyond stereotypes and convey my own experience as an Arab woman. In employing calligraphic writing, I am practicing a sacred Islamic art that is usually inaccessible to women. To apply this writing in henna, an adornment worn and applied only by women, adds a further subversive twist. 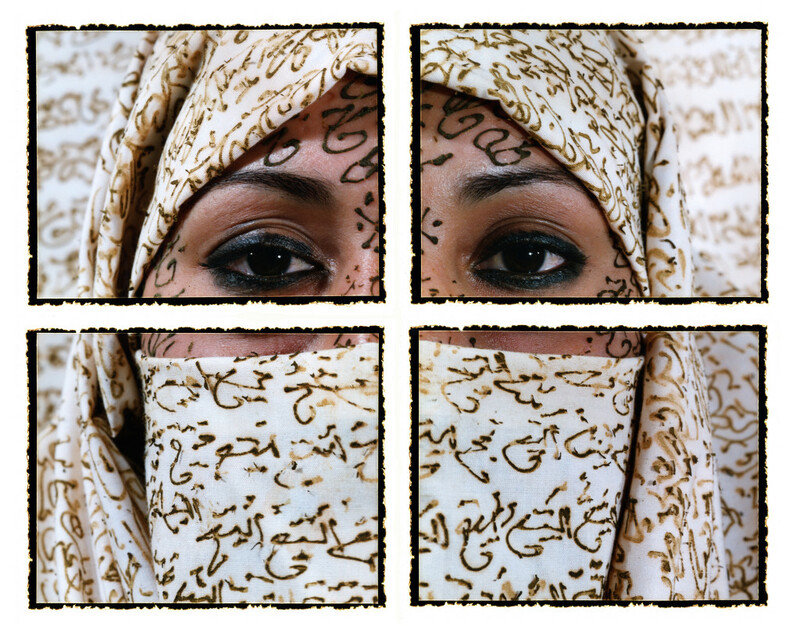 Thus the henna/calligraphy can be seen as both a veil and as an expressive statement. Yet the two are not so much in opposition as interwoven. The “veil” of decoration and concealment has not been rejected but instead has been integrated with the expressive intention of calligraphy. 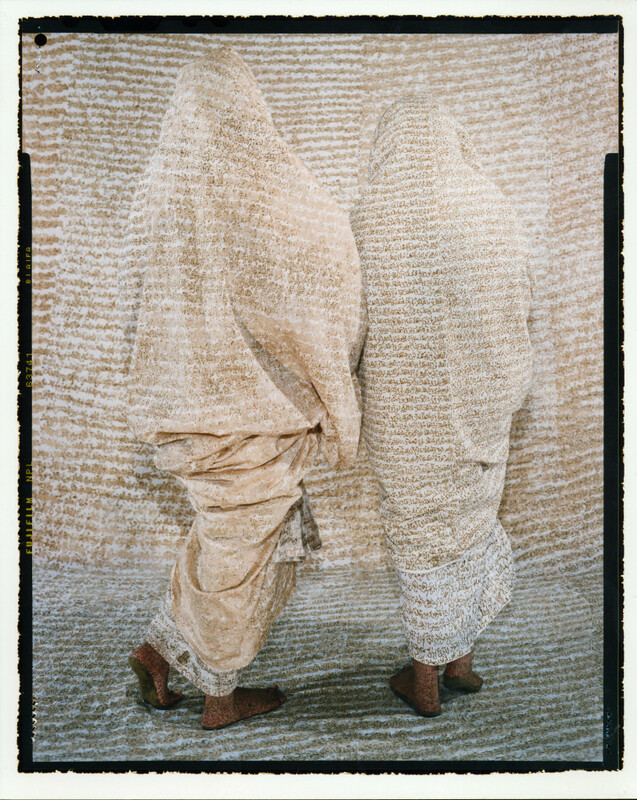 Although it is calligraphy that is usually associated with “meaning” (as opposed to “mere” decoration), in the visual medium of my photographs, the “veil” of henna in fact enhances the expressivity of the images. By the same token, the male art of calligraphy has been brought into a world of female experience from which it has traditionally been excluded. Also, by choosing to use a number of women, I subvert their imposed silence. These women “speak” through the language of femininity to each other and to the house of their confinement, just as my photographs have enabled me to speak. 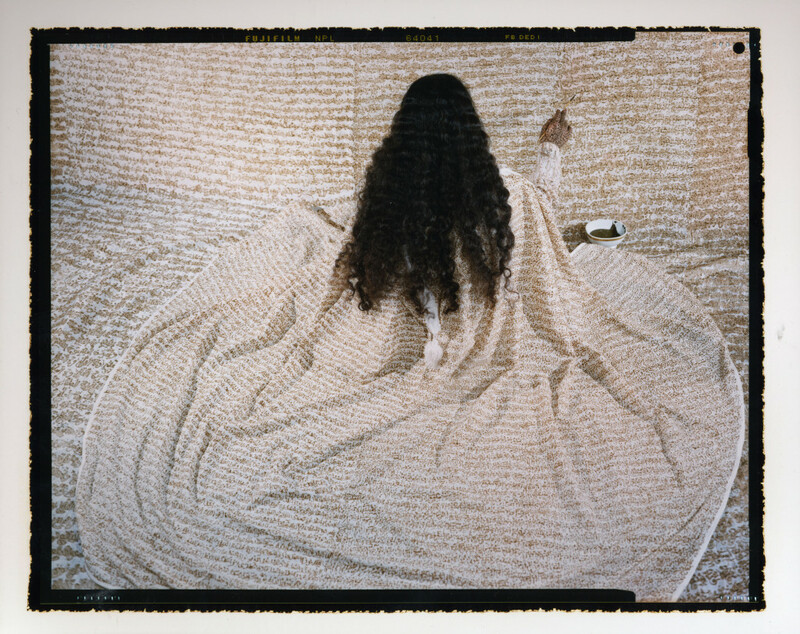 Through these images I am able to suggest the complexity of Arab female identity – as I have known it–and the tension between hierarchy and fluidity at the heart of Arab culture. 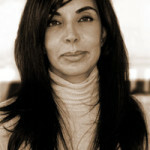 By reclaiming the rich tradition of calligraphy and interweaving it with the traditionally female art of henna, I have been able to express, and yet, in another sense, dissolve the contradictions I have encountered in my culture: between hierarchy and fluidity, between public and private space, between the richness and the confining aspects of Islamic traditions. As an artist now living in the West, I have become aware of another space, besides the house of my girlhood, an interior space, one of “converging territories.” I will always carry that house within me, but my current life has added other dimensions. There is the very different space I inhabit in the West, a space of independence and mobility. It is from there that I can return to the landscape of my childhood in Morocco, and consider these spaces with detachment and new understanding. When I look at these spaces now, I see the two cultures that have shaped me and which are distorted when looked at through the “Orientalist” lens of the West. This new perspective has led me in my most recent photographs to situate my subjects in a non-specific space, one which no longer identifies itself as a particular house in Morocco, but rather the multivalent space of their/HER own imagination and making. In these images, the text is partly autobiographical. Here I speak of my thoughts and experiences directly, both as a woman caught somewhere between past and present, as well as between “East” and “West,” and also as an artist, exploring the language in which to “speak” from this uncertain space. But in the absence of any specificity of place, the text itself becomes the world of the subjects – their thoughts, speech, work, clothing, shelter, and nomadic home. This text is of course incomplete. It involves the viewer as well as the writer in a continual process of reading and revising, of losing and finding its multiple and discontinuous threads. Similarly, figures of the women in the photographs can only be gathered and informed by multiple visual readings. As you can see, the Orientalist tradition is more directly called forth, and played with, in my most recent photographs than in earlier ones. But again, this is only a matter of emphasis, yet another layer in the palimpsest of readings I hope to evoke in the viewer. Ultimately, I wish for my work to be as vividly present and yet as elusive as “woman” herself — not simply because she is veiled or turns away – but because she is still in progress.